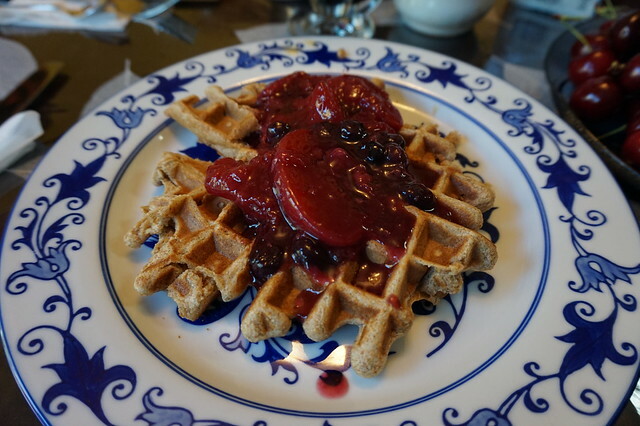 Breakfast at Home and Clever Rabbit – Roadtrip 2014 – vegan in your city. My mom also made us waffles – but I didn’t have the wherewithal to take a photo until the last waffle as you can see above in all of its glory. Over the last few years my mom has become an especially incredible vegan cook (because she follows a primarily plant based diet) – so it’s always nice to come back and get a tasty home cooked meal. It’s actually quite tough being away from my parents, flights to Edmonton from Toronto are usually quite expensive, and it’s not always easy to find time to get away, so I was happy to visit back in the summer of 2014 and also a month or so ago. We’d see each other again a few times on this visit, but it was nice to have breakfast with the family like old times, and have JC join us. Nearly every time I visit Edmonton, I have gone to Clever Rabbit, vegetarian cafe So After visiting with my parents and driving around for a while, we went to 124st hoping to eat something fun. I knew there was a farmers market we could enjoy, and Clever Rabbit was there with their usual vegetarian options. Over the last few month more vegan friendly and 100% vegan spots have opened up on 124 st. Like Arcadia, a spot I excitedly got to try this past March, and hope to write about next. Anyway, we were at Clever Rabbit that morning and ate well. It’s not 100% vegan, but maybe someday (or maybe not). 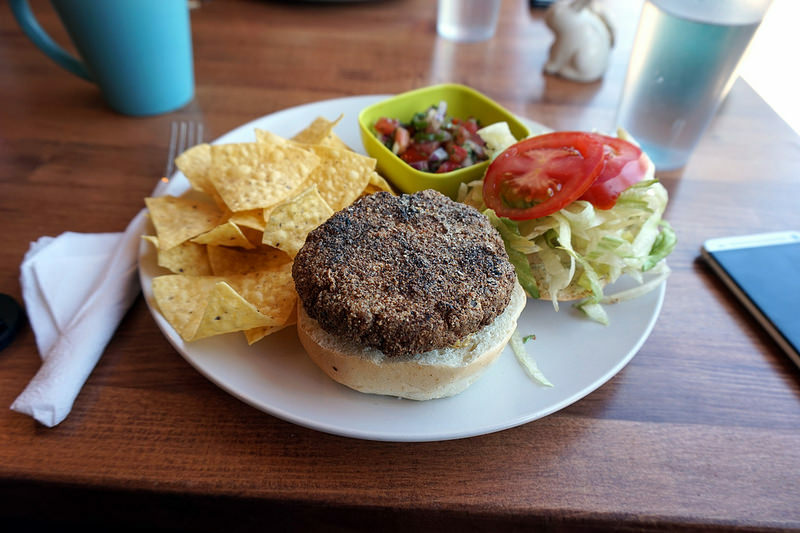 I had the Walnut Chickpea Burger and it was okay, but I was mostly just into the salsa and chips. I don’t really know what possessed me to order this burger, because I’m generally not really into burgers at the best of times – but I’m certain it was related to our recent campfire adventures. The salsa though, every time I go to Clever Rabbit I just want to take a bucket of salsa home with me. 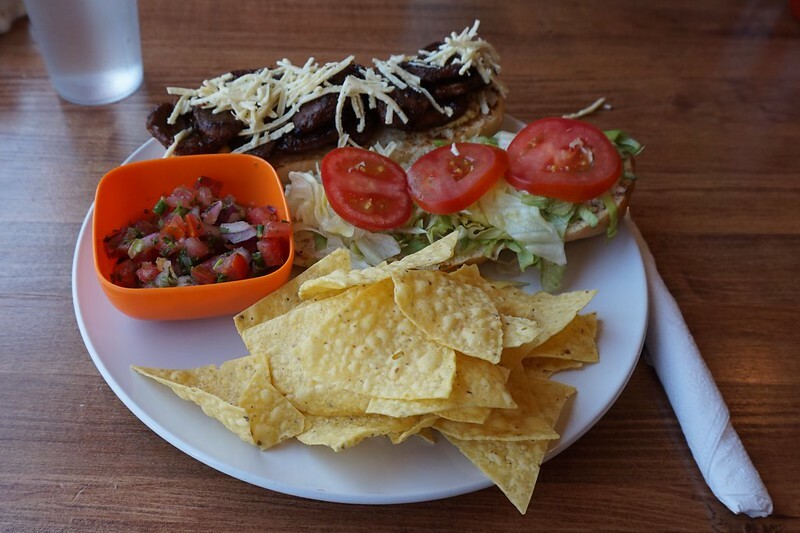 So, if nothing else – make sure you try the salsa at some point. I would have liked more sauce or ketchup or something on the burger, and should have asked for some more condiments. Otherwise the lettuce was fresh, and the buns were nice and fluffy. What I did end up trying to steal was JC’s Philly cheesesteak (which again, obviously vegan, since we’re eating it. ), I liked the saucyness, but wish the daiya was meltier. One thing of theirs that I do really like is the Vegan Donair, which I’ve tried a few times over the last several years and it’s generally a good idea. Then it was time for dessert. There were a lot of options to choose from. 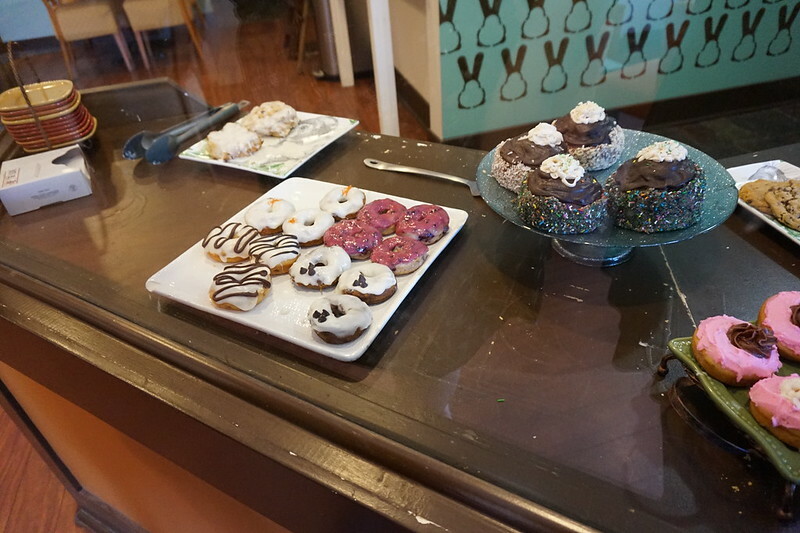 But oddly enough – we didn’t get a donut. We got an fritter and a cookie. Both of which were pretty tasty. Service was friendly, we were the only ones inside for a long time so we got to sit by the window at the front and take in some of the mid-afternoon sunshine.